KWOYA FAGIN MAPLES is a writer from Charleston, S.C. She holds an MFA in Creative Writing from the University of Alabama and is a graduate Cave Canem Fellow. 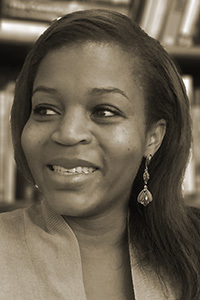 In addition to a chapbook publication by Finishing Line Press entitled Something of Yours (2010) her work is published in several journals and anthologies including Blackbird Literary Journal, Obsidian, Berkeley Poetry Review, The African-American Review, Pluck!, Cave Canem Anthology XIII, The Southern Women’s Review, and Sow’s Ear Poetry Review. Her most recent poetry collection, Mend, was finalist for the AWP Prize and is forthcoming from University Press of Kentucky. Edited by Lisa Williams, Mend tells the story of the birth of gynecology and the role black enslaved women played in that process. This work received a grant from the Rockefeller Brothers Foundation. read excerpts from Kwoya Fagin Maples’ MEND. BWR: What led you to the stories of Anarcha, Betsy, and Lucy? How did Mend begin for you? I researched the book in 2010, collecting and studying slave narratives, the doctor’s autobiography, surgical notes and letters. In 2011, at a writing residency, I began writing. I hadn’t written anything since that first poem a year earlier. I didn’t feel I’d have permission until I’d done my due diligence of researching. I didn’t automatically feel as though I could tell these women’s stories just because I was a black woman. I’d never been born a slave. Something that happened in the process of writing this book that I didn’t expect was how my own experience with matrescence would affect the work. In March of 2012, I found I was pregnant for the first time. After having written poems that endeavored to show the scope of the women’s lives, including their motherhood, there was so much I wanted to go back and edit. I didn’t plan on how being a mother would affect my work or the poems of this collection, but I’ve been pleasantly surprised. BWR: You grew up in South Carolina and now live and write in Alabama. The story Mend tells is a geographical one, informed by the trauma of the American South. Your poem “Oak, Pine, Basswood” makes me wonder how you and your work are informed by the literal, physical presence of the South—what does it hold, threaten, challenge? What does being immersed in the South afford your writing? KFM: Being a writer in the South means my work reflects the literal beauty of the landscape, even though that beauty is deceptive. Sometimes when I encounter a gorgeous oak tree that is hundreds of years old—that may be a focal point of a small green town— I’m overwhelmed by its beauty, but next I consider the idea that it may have been the site of something terrible. I love the lemon scent of a magnolia blossom, how it takes two of my hands to hold one, but their roots unnerve me. In the South you can’t help but think about “who.” Who owns the land and who works it? Who planted the trees and crops and built the plantations and ornate interiors of downtown buildings? I grew up in Charleston, S.C., a popular tourist destination. The historic plantations are regularly visited, as is the “City Market,” in downtown Charleston, a place where vendors sell a myriad of gifts and clothing. Tourists and residents alike love to meander down the outdoor walkway lined with long wooden tables on any given afternoon. The breeze from the Ashley and Cooper Rivers is always perfect. In the antebellum South, the “City Market,” was called the “Slaves’ Market.” It was a place where slaves sold their food and other goods. Nearby, the old slave mart building still stands, an antebellum slave auction gallery. Suffice it to say, the South, like everywhere else, is complex with its dichotomy of beauty and devastation. Nothing is ever as it seems. I am deeply intrigued and socially affected by this phenomenon so there is a depth, a well of things to write about. The title “Oak, Pine, Basswood,” is a short list of the kinds of trees in Mt.Meigs, Alabama. While writing, I traveled to the town and found many things. There were abandoned cotton fields, damaged train tracks, and juvenile prison. The town is so small it shares a library with the next town over. The strangest thing I saw was an emu in the middle of a field while I was looking for Sim’s house. BWR: Can you tell us about your relationship to visual art and how that informs your poetics? We hear that you came up with a three dimensional poetry project for your students, can you also tell us a bit about that? KFM: I’ll begin with my formal definition of 3D Poetry: “3D poetry is the intersection of visual art and poetic language. It provides an immediate image which seeks to influence and enhance the reader’s encounter with a poem.” Since 2015, my creative writing students annually exhibit their three dimensional poetry at art galleries in the city. Throughout the spring semester, students write poems based on prompts I write that correspond with a particular theme I’ve chosen for the exhibit. Last year the theme was “Light and Terror,” and the poems were speculative. Later in the semester students then create visual art in response to their own poems. It could be anything, really, but so far we’ve had original photography, film, paintings, sculpture and installations. For years I wanted to find a way to make poetry come alive and off the page. When I was in graduate school I’d often bring objects directly mentioned in poems as part of my presentations. I loved holding something solid while mentally “handling” something abstract. I love this sensation, and this is what led to 3D poetry. Ultimately, I wanted poetry to be interesting to people who considered it lofty and inaccessible. Visual art may instantly capture the attention of a viewer. That brief amount of time may influence whether the viewer goes towards the art to get a better look. When our viewers approach, they find a poem. The feedback I’ve received is that 3D poetry reaches a non-academic audience by making poetry accessible. BWR: What other mediums and types of art influence your work? KFM: Music influences me in the way it does most of us. It’s always a part of my good days, and it keeps me company on the bad ones. For me, it’s the second best thing to literature, and absolutely essential to my well-being. I often use it to write. Listening to the same song on repeat allows me to maintain my train of thought while writing or revising a poem. I suggest this practice to my students all the time. Sometimes an entire album can be the companion to a collection of work. Almost every week I go to the movies. The last movie I saw was The Meg, a film about enormous killer sharks from the deepest part of the Pacific Ocean. BWR: What books are essential to you as a writer and person? KFM: Maya Angelou’s autobiographies are what led me to poetry as a young girl so I will always be grateful for her and her work. Other essential books include: Cornelius Eady’s Brutal Imagination. The work of Lucille Clifton, Claudia Rankine and Rita Dove. Harryette Mullen’s The End of the Alphabet, Maggie Nelson’s Bluets and Terrence Hayes. Beth Ann Fennelly’s Heating and Cooling and Joshua Beckman’s Things are Happening, Frank X Walker’s Turn Me Loose: The Unghosting of Medgar Evers. The work of Toni Morrison, Stephen King, and so many others. BWR: Who are the emerging artists and writers you’re excited about right now? KFM: Ashley Jones, Alan King, Jerriod Avant, Cedric Tillman, Safiya Sinclair, Natalie Diaz and Jessmyn Ward.